Enjoying angling in Oregon’s waters brings with it some responsibilities. To ensure viable fish populations and continued fishing opportunities, all Oregonians are encouraged to make a personal commitment to the care of the state’s fish and their habitats. Positive voluntary efforts can reduce the necessity for future mandatory regulations. 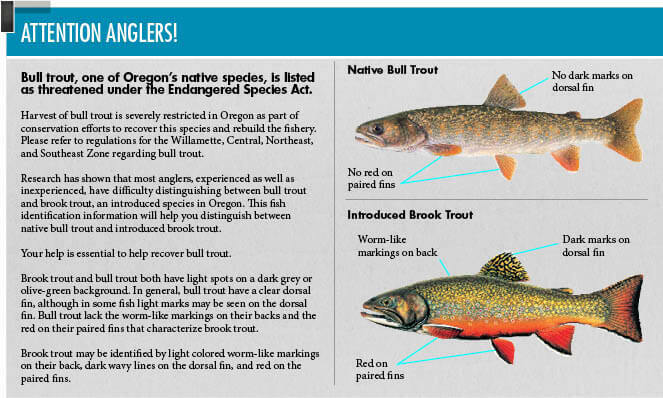 Know and follow all state angling rules and regulations. Visit ODFW’s website at: myodfw.com. Protect Oregon’s waters from pollutants and waste. Dispose of all trash, including fishing line and tackle, at collection stations or disposal sites. Ask first! Do not trespass on private land. Be courteous to other anglers, boaters, hikers and campers. Remember that warm water conditions can stress salmon, steelhead and trout. Seek cooler waters during summer months, especially early in the day. Report angling violations to the Oregon State Police at: 1-800-452-7888. Teach future generations how to enjoy and conserve Oregon’s fish and their habitats. Use barbless hooks so you can easily release your catch. Use pliers to pinch down barbs. Use tackle strong enough to bring your fish in quickly and gently. Land fish as carefully as possible. Avoid removing fish from the water, but if you must, use a cotton or rubber net — not nylon. Keep your hands wet when handling fish. If taking a photo, cradle the fish at water level and quickly take the picture. Remove the hook quickly and gently while keeping the fish under water. Use long-nosed pliers or hemostats to back out the hook. If a fish is hooked deeply, cut the line near the hook, which will dissolve. Point the fish into a slow current or move it back and forth until its gills are working and it maintains its balance on its own. Be patient! When possible, let it swim out of your hands.